it's common knowledge that most cats don't like water. however, leko absolutely l-o-v-e-s water. he loves to drink it, play it in, and get wet in it. we joke around and say that he's really a penguin in disguise in a kitten suit because he loves anything cold and anything wet. you know, it's a typical occurrence to find leko in the tub drinking water out of the faucet. 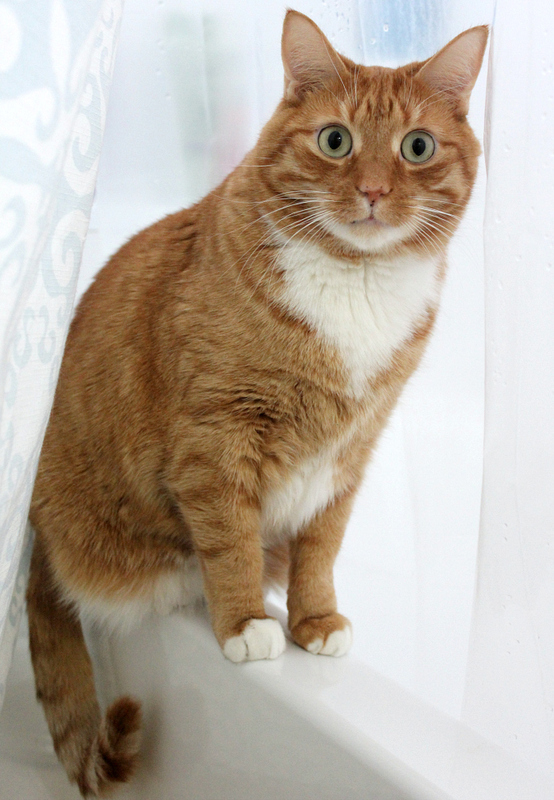 most mornings he loves to walk on the edge of the bathtub between the outer fabric shower curtain and the inner plastic curtain liner. it's the perfect place for him to sit, and it makes a nice little runway for him to walk back and forth while we shower. i'm always so nervous that he's going to fall in and get soapy since it's like a circus tightrope walk. i snapped a picture of him this morning in his usual place after a shower . . . silly kitten! Look out if he does fall in. He will bounce out real fast like a flash of lightning. Bo has done that several times until she learned.